I think this cool, because I like clothes and I like to match my clothes all the time. I think this is a good idea to put this in stores so they can see what matches and what doesn't match. I like the concept of this memory mirror, but what it malfunctions and loses all of the data? I think it is a good idea because I am always looking all over a store trying to find a shirt to go with shorts. It will probably save time for people that are in a hurry. I researched and found out that about 41 million people shop on Saturday. Also 73% of people want to touch or try on merchandise before purchasing. I think it is really fascinating that A dressing room can be so high tech. I wish they came out with it a long time ago. Im guessing that it took a while to create the technology to do that. New technology is available for customers to see what they look like in certain clothing. The text states that dressing rooms are putting a new mirror that acts as way to show you how you look in different clothes without putting them on. The text also states that it can help you complete an outfit. Evidence from the text suggest that more technology like this will be put into stores and maybe other places. This is honestly so awesome. It's truly amazing how much technology is changing and what it is evolving into. I think that this will definitely become the next big thing. A new technology regarding dressing rooms and customers' clothing has just emerged. 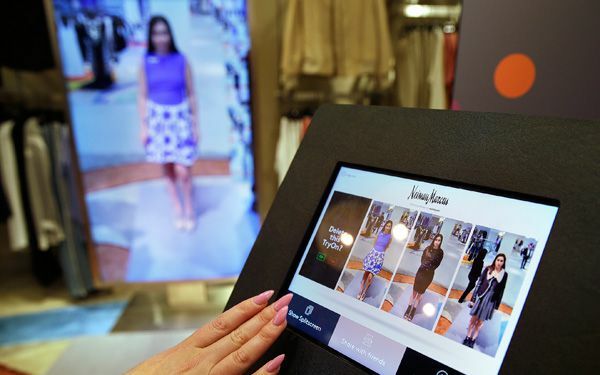 Stores like Bloomingdale's and Nordstrom has put these new high tech mirrors into their dressing rooms. The mirrors allowing someone trying on clothes to match other clothes together with the ones they had already brought in to try on. The mirror takes snapshots and videos that can also allow one to see what the article of clothing will look on them, without trying it on. I think that this is really cool and I can't wait to try it out myself.